Dan and I wrapped up our road trip through Serbia, Bosnia, Montenegro and Croatia and jumped in the car with our friends from New York who were doing a 2 week trip in Slovenia and Croatia. We met them in Ljubljana, stayed for a night and then headed towards the Alps of Triglav National Park in the Northwest of Slovenia. From Ljubjiana we headed to Lake Bled, and stopped for an hour or so for lunch and to walk around. There was some sort of rowing competition going on, and the lake was fairly busy so we didn’t spend much time. From there we went to Vintgar Gorge, which I absolutely recommend. 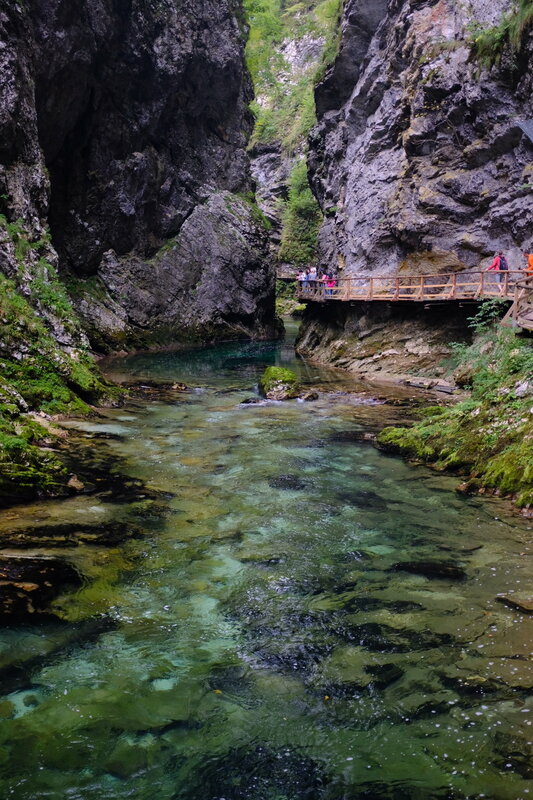 It was quite crowded and navigating around the tourists on the narrow path along the gorge detracted slightly from the experience, but the water and scenery was incredible. We continued towards our airbnb in Trenta. We had heard that the drive up was an experience, which proved to be 100% accurate, especially in the downpour that we were in. It was essentially an hour or so of tight switchbacks on very narrow roads with motorcyclists with death wishes zooming past us in both directions. Unfortunately, we had very poor weather and weren’t able to do the hikes we had hoped to do. With the weather confining us to the indoors for the most part, we did what we do best –eat, drink and cook. We had a nice lunch at a little restaurant that just opened, Mangrt. A few young friends started it this summer and were making simple, high quality dishes. The menu was small but tasty with local meats and cheeses, salads and burgers, and good music. We just barely made the cut off, as they decided while we were there it was too slow and rainy to stay open, and were going to close the restaurant down for the season a few days early. We hopped from restaurant to restaurant to stay dry while in Bovec, Kobarid and Tolmin – although a few we were hoping to try out, such as Hisa Franka, were closed on the days we were there. The scenery was incredible, and the clouds and rain added a misty, mysterious depth to mountains, valleys and rivers. Although I don’t have an abundance of specific suggestions for the area, my piece of advice would be GO! Slovenia is gorgeous and is a place we hope to visit again soon. Mystic and Moody Triglav National Park.